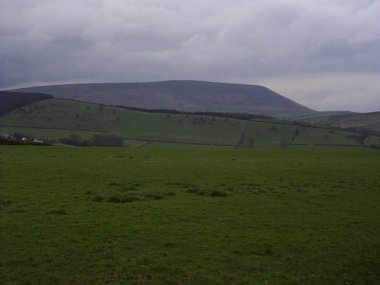 The dominant feature of the landscape around Pendle, and where the area gets its name. "A Tour of Pendle Hill" - A slide show by Neil Whalley, a keen walker and runner in the Pendle area. The show starts at Spring Wood goes in a clockwise direction around the base of Pendle Hill with occasional detours up on the hill itself taking in any points of interest en route. If you'd like to book Neil, please email him. Pendle Hill is the remains of a vast plateau (the delta of an ancient river) of sedimentary rocks which lie over an ancient limestone bed. It is composed mainly of Carboniferous Millstone Grit which offers some protection from erosion by the actions of wind and rain - which it enjoys in great abundance all year round! Even this protection is not enough to bring mud slides and rock falls from the softer shales which lie under the gritstone. At its extreme, features like "Burst Clough" (near Worston) are formed when the pressure of water inside gives rise to a great outpouring of water, mud and rock. There is evidence of Stone Age and Bronze Age man's activities in the area but we must thank the Celts, and maybe the Angles for naming the hill "Penull"* over 1000 years ago. See Craven & Pendle Geological Society's excellent site for more info. *"One of the oldest place names in our immediate neighborhood is Pendle. Pendle was spelt Penhille in 1296 and shows the Celtic word Pen meaning hill to which the English, perhaps not realizing the meaning of Pen, added their own word hill." From "The History Of Marsden And Nelson", by W. Bennet, M.A. Most of Pendle Hill is covered by a thick blanket of of peat formed from the decomposition of Sphagnum mosses and preserved by the acidity produced in the process. This bog like environment provides a rich habitat for many plants, birds and animals. Many berries can be found growing at various places on the hill: Crowberry, Bilberry and Cloudberry (mountain strawberry) have all be found. There's even talk of Cranberry on Pendle as the wet and slightly acidic conditions that dominate the upper plateau are ideal for this sensitive plant. 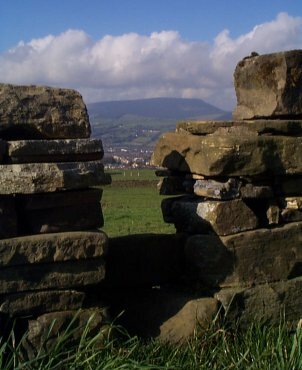 Check out Bill Samuel's commentary and pictures of Pendle Hill in Quaker Tour of England, Page 11 of 22. See our page on the Pendle Witches. Pendle Hill in the distance taken on a sunny afternoon (17 Oct 2000, 12:15) from near the Shooters Arms on road over the top of Nelson to Catlow Bottoms. 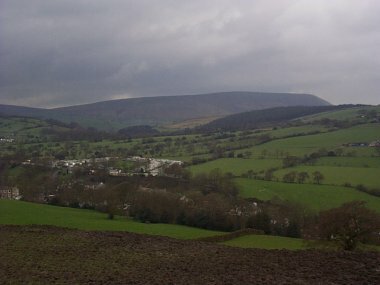 Pendle Hill from the top of Nogarth on a typical dreary day (06Apr1998, 16.45). 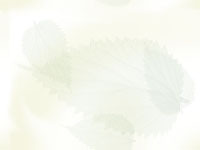 PendleHill.com - Pendle Hill Research Service, Inc.